When we last left Phantom Creek Estate winery it wasn't much more than some drawings and a hole in the ground on the Black Sage Bench, just outside Oliver B.C. We returned this summer to track its progress, and a lot has happened. The 79,000 square foot building is finally showing above ground. The outlines of the two-storey hospitality centre, restaurant and outdoor amphitheatre, all positioned to take in the spectacular view south and down the valley to Osoyoos Lake, are now visible. On the vineyard side there has been some equally impressive work. Last November they acquired a large site on the Golden Mile Bench from CC Jentsch and then heading due west over Mt Kobau they also purchased a substantial patch of sloping land in the Similkameen Valley near Vanessa Vineyards. The Similkameen site is steep, rocky, virgin land slated to be planted to vines in 2019. 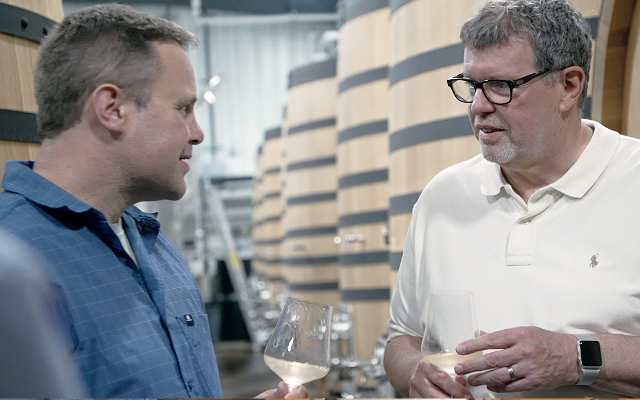 At the temporary winery, famed French consultant Olivier Humbrecht oversaw the first white wine at Phantom Creek in September 2017, a pinot gris from select vineyards in Okanagan Falls and East Kelowna. We tasted the impressive gris and several other wines including a sparkling offering by Humbrecht and Phantom Creek winemaker Ross Wise, and Wise’s first stab at the much vaunted syrah from the original Phantom Creek Vineyard site on Black Sage Road. We took some great shots and spoke to Ross and Phantom Creek's Marketing Manager Geoffrey Moss about the all the latest happenings as the winery prepares to release its first wines to the public in less than a year from now. It’s your chance to get a glimpse at the Next Okanagan.